Written on September 30, 2014 . Posted in Announcements + Updates, Fine Arts. Dirty Looks NYC celebrates the release of the Angela Dufresne (Assistant Professor, Painting) and Jane South (Critic, Sculpture) publication – CHECK YOUR VERNACULAR– at Printed Matter’s New York Art Book Fair with a performance and screening event featuring work by Dynasty Handbag, Narcissister, Colin Self and Chris E. Vargas. 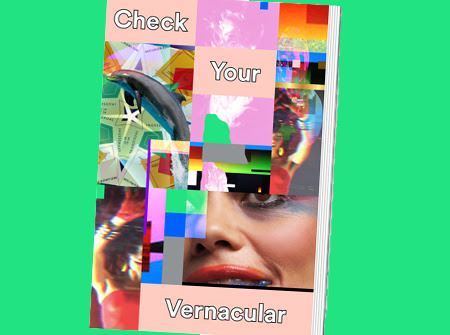 CHECK YOUR VERNACULAR – published on the occasion of the exhibition commissioned by Rhode Island School of Design (Memorial Hall, Sept. 30 – Oct. 21) – assembles the objects, costumes and ephemera of contemporary queer performance. Exploring the distinctions between avant-garde cinema and queer moving image and performance cultures, CHECK YOUR VERNACULAR situates the work of these four artists in a central camp – assembling these diverse and richly documented hirstories. This publication was funded in part by The Robert Turner Theatrical and Performance Design Project at RISD, established to support the teaching of interdisciplinary courses that integrate various elements of theatrical and performance design.